Gulf of Guinea piracy is set to become the next major concern for oil shipments as attacks, particularly on oil tankers, are on the rise, along with insurance premiums for shippers; but a recalculation of security needs beyond the short-term requires understanding the complex dynamics of a number of conflicts and a variety of groups. In February 2012 alone, eight oil tankers were hijacked in the Gulf of Guinea, off the coasts of Nigeria, Benin and Cameroon – double the number from the previous month. A total of 13 attacks have been reported for 2012, almost half of those off the coast of Nigeria. Last year also saw a marked increase over the previous, with 64 reported hijackings in the gulf. The modus operandi is to take control of the tankers for approximately two weeks while cargo is unloaded and transferred to Nigerian tankers and then sold in Nigeria or Benin. The countries off the coast of the Gulf of Guinea - Angola, Nigeria, Ghana, Ivory Coast, Democratic Republic of Congo and Gabon – produce over 3 million barrels of oil daily, largely for North American and European markets, with Nigeria responsible for 2.2 bpd of that total. Rising crude oil prices and unrest in the region, particularly in Nigeria, are lending greater impetus to Gulf of Guinea piracy, which has the potential to become as great a threat as piracy in the Gulf of Aden. The bulk of the hijackings so far have taken place off the Nigerian and Benin coasts, and in particular around Nigeria’s port of Lagos and Benin’s port capital of Cotonou. Last year saw 34 attacks off these two port cities, nearly triple the number for 2010. Other cargoes are also targeted, including cocoa and metals destined for world markets. The motives are both financial and political, and the developments driving the increasing trend varied. One aspect contributing to increasing hijackings is the January 2012 decision of the Nigerian government to remove state oil subsidies. That decision led to mass protests, especially in Nigeria’s north, which threatened to evolve into an Arab-Spring situation. At the eleventh hour, Nigerian President Goodluck Jonathan backtracked, still reducing the subsidy, but not reversing it entirely. This served to halt protests for the most part, but there have been other implications. Specifically, the removal of the fuel subsidies has hindered the smuggling of oil products from Nigeria across land borders, resulting in a shift to hijackings at sea. The results of Nigeria’s reduction in fuel subsidies were particularly felt in Benin, where gas prices tripled. The removal of the fuel subsidies and the closing of the border between Nigeria and Cameroon could also be contributing to the uptick in Gulf of Guinea piracy. While smugglers are still working to get product across borders into Chad, Cameroon and Benin, the margins are not nearly as high and the difference must be made up elsewhere. Nigeria is also grappling with a growing threat from the militant Islamic group, Boko Haram, which is likely to seek alternative avenues of funding as Nigerian security forces increase their reach and step up their fight against terrorist attacks. Lower level organized crime is likely to be their main funding outlet for 2012, but there is a valid concern that the group could join forces with the best smugglers in the Sahel – Al-Qaeda in the Islamic Maghreb (AQIM). In Nigeria’s south, Militants of the Movement for the Emancipation of the Niger Delta (MEND) are using Gulf of Guinea piracy to raise the stakes for pushing Nigeria’s president to meet their resource and revenue demands. In fact, they claimed responsibility for a 28 February attack on a Dutch cargo ship off Port Harcourt and the kidnapping of three crew members. MEND has not previously been definitively linked to piracy networks operating in the Gulf of Guinea, but this type of expansion could internationalize the Niger Delta conflict. The dynamics of Gulf of Guinea piracy is complex and very fluid, making it very difficult to trace hijackings and the end user of ransom payments. Transnational mafias could be financing the operations and are known to have extensive intelligence capabilities and to use various groups for cover in a cooperative arrangement. The Gulf of Guinea could end up supplying as much as 25% of US oil by 2015, and it is with this in mind that Washington is working towards a more improved security agenda and increased cooperation with African nations and their naval forces in the Gulf. 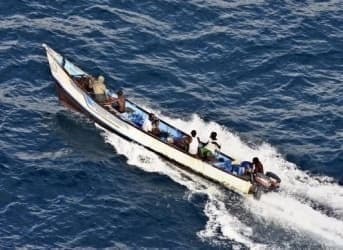 The Nigerian government’s inability to adequately address issues in the Niger Delta and in the north, where Boko Haram operates, as well as corruption within its own ranks, will hinder progress on the anti-piracy front, while attacks could also increase on expectations over new oil finds off the coasts of Liberia and Sierra Leone.